Frosted Funfetti Cookies – Soft, thick and chewy cookies loaded with sprinkles, topped with vanilla frosting, and even more sprinkles! 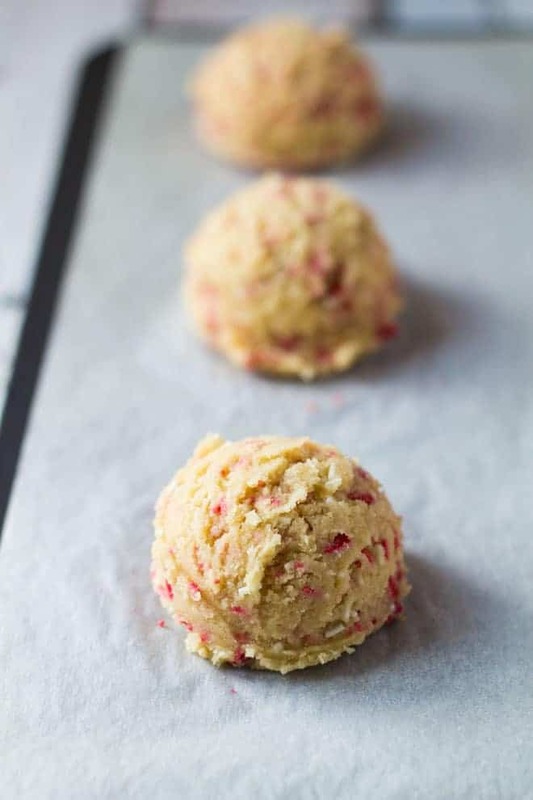 This is my favourite funfetti cookie recipe. 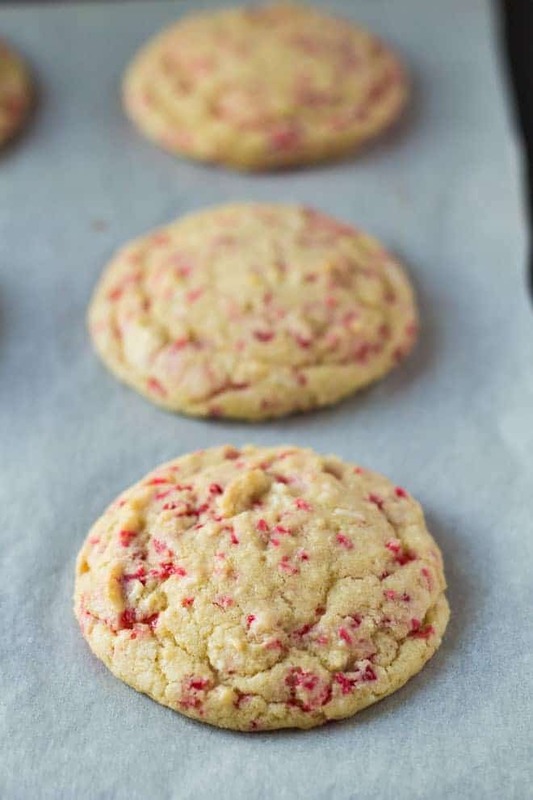 They are soft, they are chewy, they are thick, they’re exploding with sprinkles, and they are actually pretty cookies! Oh, and no chilling time, they are good to eat in under 30 minutes! And because Valentine’s Day is just around the corner, I went ahead a stuffed these cookies full of pretty heart sprinkles. These are just perfect for surprising your loved one with! This recipe makes 12 decent sized cookies, so that’s 6 cookies each! These cookies are just fine one their own without the frosting, but personally, I love the extra sweetness. And who can say no to a delicious swirl of vanilla frosting on top of a funfetti cookie? Not me! 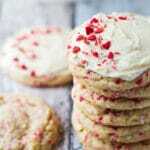 More cookie recipes to try next! 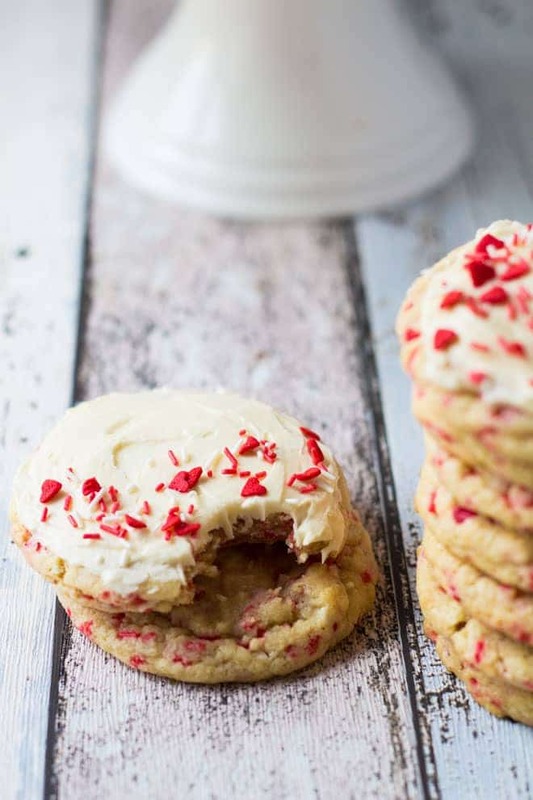 Soft, thick and chewy cookies loaded with sprinkles, topped with vanilla frosting, and even more sprinkles! Microwave the butter for 40 seconds, to just barely melt it. Whisk in the sugars until combined. Add the egg, and vanilla, and mix until combined. Add the dry ingredients, and mix until just combined. Fold in the sprinkles. Using a medium cookie scoop, scoop out 11 - 12 dough balls, then place on the prepared baking tray. Bake for 8 - 10 minutes. Allow to cool on the baking tray for 5 minutes before transferring to a wire rack to cool completely. Using a handheld or stand mixer fitted with the paddle attachment, beat the butter on medium speed until smooth and creamy. Add the icing sugar, heavy cream, vanilla extract, and salt. Beat on high speed for 3 minutes. Add more cream for a thinner frosting, or more icing sugar for a thicker frosting. Frost the tops of each cooled cookie, and decorate with sprinkles. Oh wow! How adorable these cookies look. I love the idea of adding a light brown sugar. I will have to give these a go!! YUM! Love, love, LOVE this recipe! 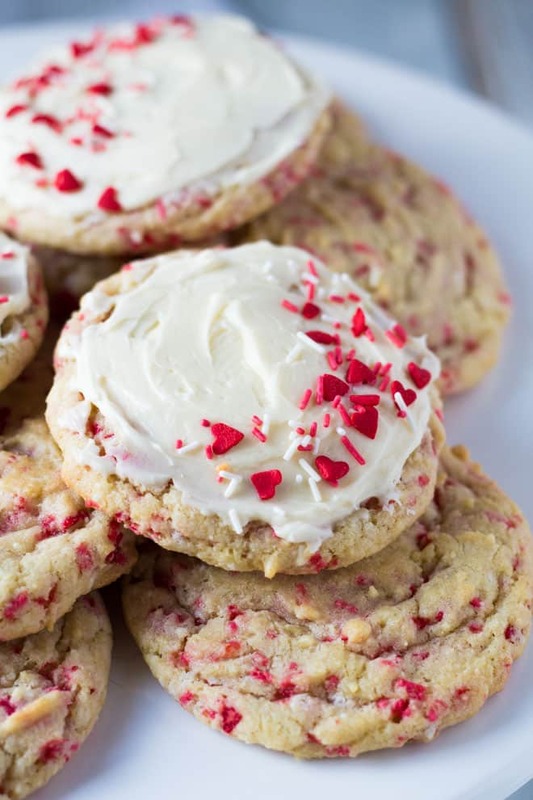 I haven’t made funfetti cookies in forever, and I’m totally going to grab some sprinkles at the store when I go next so I can make these beauties for Valentine’s! Nice work! These cookies are so bright and colorful! A real yumminess not only for the stomach but for the eyes as well. Winter is so gloomy… but these cookies makes me happy. Mmmm, this recipe looks so delicious. Funfetti cookies are my favorite! These cookies look so tasty! I love those cute little sprinkles! Happy early Valentine’s Day Marsha! Thanks, Shelby! Happy early Valentine’s Day! These are such adorable cookies! These are such fun cookies! I love the colored sprinkles, these cookies surely look unique and delicious! These cookies are so gorgeous, Marsha! I love the bits of color inside and the delicious frosting on top! Perfect Valentine’s snack! OMG, LOVE LOVE LOVE these cookies, Marsha!! 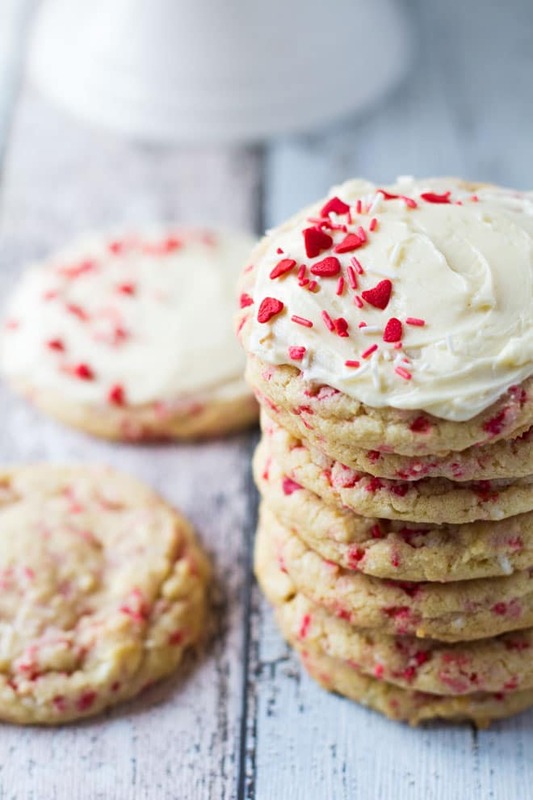 Soft and chewy cookies are my weakness and anything with sprinkles makes me swoon! Totally wanting to devour a dozen of these beauties for breakfast! Pinned! Cheers! WOW! They look so beautiful and delicious! I’ve never frosted cookies, it sounds great! The cookies are really so pretty! Love the way these cookies look! They’re so pretty and perfect for Valentine’s Day. I’m sure they taste as good as they look, too! HI! I am planning on making these cookies and shipping them to my granddaughters. Does the frosting harden? If not, shipping them would probably not work. I will make them today for my niece as a trial run. Hi Barbara! Yes, the frosting will harden overtime.